African-Americans have lived in Madison since at least 1846, but little of their history and the vibrant communities they formed, has been written in history books. 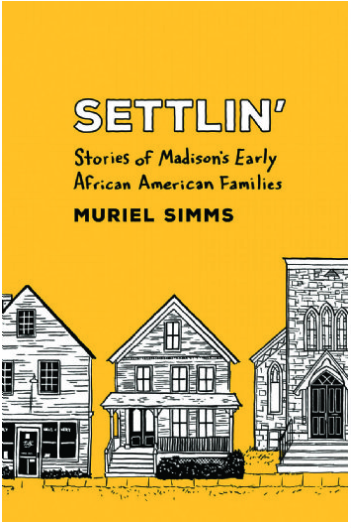 Muriel Simms, a lifelong Madison resident and longtime educator in the Madison Metropolitan School District, has taken that history, passed down orally from generation to generation, and recorded it in her new book, "Settlin': Stories of Madison’s Early African American Families." Simms recently spoke with WPR's "Central Time" executive producer Judith Siers-Poisson. Judith Siers-Poisson: You spoke with descendants of 25 of Madison's first African-American families, what brought them here? Muriel Simms: I interviewed people who are the descendants of people who came here in the early 1900s, that is really basically when the majority of people started coming to Madison and settling here. The reasons that I could figure out are that they had relatives already here, or by word of mouth. In my dad's case, he came up here in 1927. John Parrish (a friend) knew him in Missouri, found out he was here and followed him up here. Others happened to hear about Madison and came here, and others were traveling through Madison, liked it and stayed. JSP: There are stories in your book that relate to the experience of living in different parts of Madison, but the neighborhood that's mentioned over and over is the Greenbush neighborhood, or the ‘Bush. Tell us about that neighborhood in the early 20th century when many of those black families were making it their home. MS: I remember that it was a very cozy neighborhood and that people seemed to get along very well. That is the fundamental truth of that neighborhood, regardless of the ethnicity, folks there got along and they helped each other. There seemed to be very little, if any, conflict whatsoever. JSP: That's interesting because it was African-American, it was also very Italian and very Jewish. So one could imagine that there might have been conflict, but it did seem like there was something that pulled those families together. MS: They were in a similar income level. They were all struggling, many of them had two jobs. They seemed to be kind of in the same boat so to speak. So there really was no reason to get excited about race or income or gender, any of those issues that we commonly find ourselves in today. JSP: What were some of the institutions that were hubs for the African-American community in Madison in those early days? What brought people together? MS: The church was the main one. The socializing activities that they came up with helped pull them together. They also went to Brittingham Park for picnics or for outdoor gatherings. They had clubs, at least seven or eight clubs, most of them were women's clubs. And a couple of them were men's clubs like the Lodge. So they had their way of creating their own institutions in order to socialize and find mentorships and friendships. They were also an avenue by which newcomers could get settled. They came to know people who could help them find lodging, helped them find a safe place to be. JSP: How much of that is still true today? MS: That's a difficult question for me to answer. The reason is that because of my own memory of how it was back then and how close it seemed we were, it's hard for me to even think that organizations and clubs that are organized today have that same kind of feeling. The demographics have changed in Madison. There are many more churches, many more organizations some of them are discriminatory in some ways. We didn't have that back then. So there are many changes that could be discussed ... and are up for discussion. Definitely, there's a change. JSP: Challenges in housing, employment and education seem to have been common problems to face ... whites didn't want to rent to African-Americans. MS: Yes. Many of the families housed newcomers. My family had a small house but we rented rooms to students. But there were many other homes in the 600 block of Dayton Street as well as the Allison House, the most famous house on Mound Street, that housed African-Americans who came here, not just individuals but families. JSP: Because there were a lot of doors that were closed to African-Americans for employment, they often started their own enterprises. MS: They did. Many of them were barbers. One of the misconceptions about barbershops is that some people seem to think, some newcomers, black newcomers I will say, seem to think that barbering started in 1950. Well, barbering goes back prior to 1900, and we had barbershops from 1900 to 1950. So,, one of the purposes of the book is to clear up some of these misperceptions that are going around. I began to hear not so good things said, misperceptions, misconceptions, mischaracterizations of early African-Americans, that bothered me so I felt like I had to work a lot harder to get this book done and get it out in the public's eye so that the public could understand that we really had a thriving community.